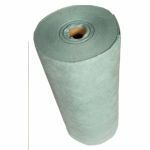 An Oil and fuel Absorbent Roll is an exceptionally efficient when you need to cover a large area of petroleum, or oil based-based, fluids and not absorb water. Not only is it an economical method for use with large spills, compared to other kinds of oil absorbents such as pads, you can use it on smaller spills as well, simply tear off the length needed. Lightweight Blue rolls often get used as a wipe in workshops due to its fast wicking properties.